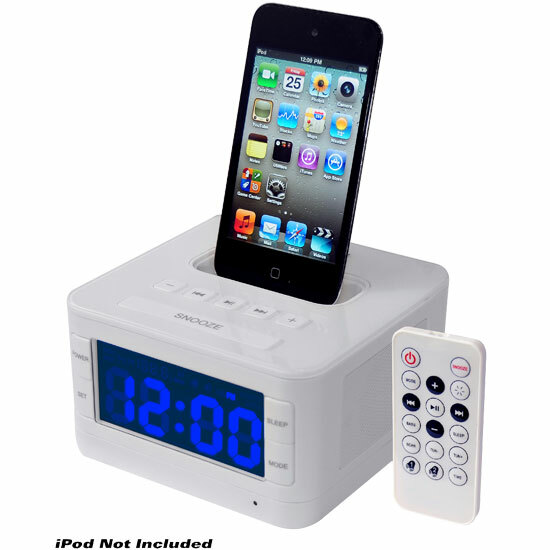 This clock radio with iPod/iPhone dock connector is the perfect accessory for your bedroom. It also makes a great gift for the college student. It's equipped with an FM radio, clock, and it's compatible with almost all iPods and iPhones - it can play your iPod's music through the built-in speakers and charge your device. Store up to 10 preset stations. The LCD display shows the time in 7 user-selectable colors. Dual alarms with snooze function and gradual wakeup. 40 watt speakers. Runs on 110 V AC, with a DC 3V battery backup (not included.) Color: white.